Episode #91: How to Answer the Question, "So...What Do You Do?" A community where independent does not mean alone. You only get one chance to make a first impression and it only takes an average person as little as 30 seconds to make a judgement about you. The first interaction you establish can be crucial when it often sets the tone for the relationship that follows. In this episode of Money Script Monday, Dan provides a three-step formula for creating a powerful one-liner. Click on the whiteboard image above to open a high-resolution version of it! This post is intended for financial professional use only. Hello there, and welcome back to another episode of Money Script Monday. "So, what do you do?" This question gets brought up all the time. Every single time you meet somebody for the first time, this is the very first question they're going to ask. And that's why it's so important of how you respond accordingly, because this could either make or break a sale, maybe even a referral. "Hey I know who needs this kind of help." What I want to do today is provide you with a formula for how to create your own one-liner and help increase your sales. You're handing them a business card, and this business card is going in their Rolodex in their head. Within this Rolodex, it's not alphabetical order by any means. It's broken down into categories, categories of the problems that you solve. "How can you help me? And that's where I'm going to put you my category. That's why it's so important to respond accordingly and answer that of how you resolve that problem for them. Before we jump into it, what I do want to say is that this episode is inspired by a man named Donald Miller. He's kind of blown up in the marketing scene. I'm currently reading his book "Building a StoryBrand". And I found his information to be very valuable, so I hope you do too, in this episode. 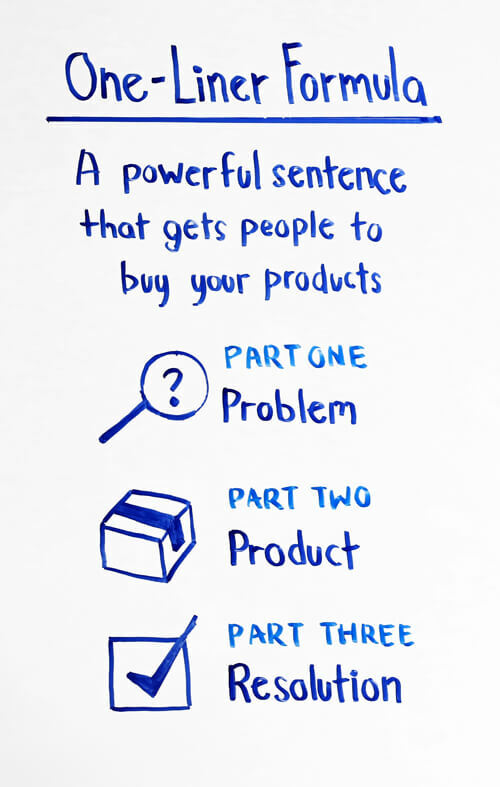 A one-liner is a powerful sentence that gets people to buy your product. It's very important to keep in mind that the words that you use are very powerful. And again, that can make or break a sale for you. This formula, it's broken up into three different sections here. And if you think about it, this is the age-old storytelling process. Part one, what you want to do is talk about the problem. You want to define a problem that's going on in your target market's head. "Yeah, that's me. I have that problem. How can you help me?" And this is what we call in storytelling, this is the hook of it. If you think about basically any movie, this is act one. "I want to learn more information. I want to go with you on this journey in this movie and find out what happens." That's why it's critical to open up with a problem. I left with a sample today. This is something that you could use or create your own. "You know, most retirees have no idea how to turn their assets into income." "Yeah, that's me. I've been saving my money. I've got a 401(k). But as far as how to take that money and use it towards income, I have no clue how to do that." What you want to do is provide a product. This is the solution that's going to solve that problem for them. "We provide a five-step process that's simple and effective." 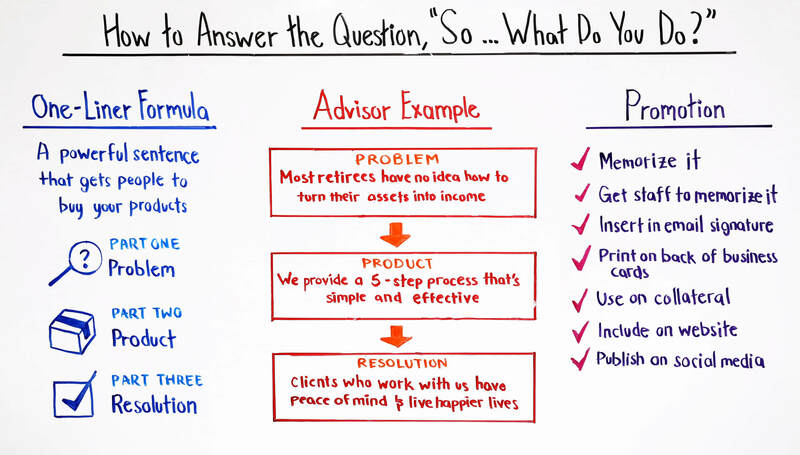 And notice I didn't say "Index universal life," or "I'm not going into a fixed-index annuity" because those types of products don't make you different. What makes you different is having a proprietary process where those insurance products, they're simply tools within each one of your steps there. And if you need some help establishing your own process, Kevin does a great job explaining that and helping you craft that in Episode 79. Go back, watch Episode 79 to create your own process. After really showing them the product that could solve that problem for them, what you want to talk about is the resolution. What's this transformation that happens of the problem the target market had, the product that was used for, and what's the resolution? "Clients who work with us have peace of mind and live happier lives." That's all that's needed within that one-liner and it will increase your sales. “I own a financial service company. 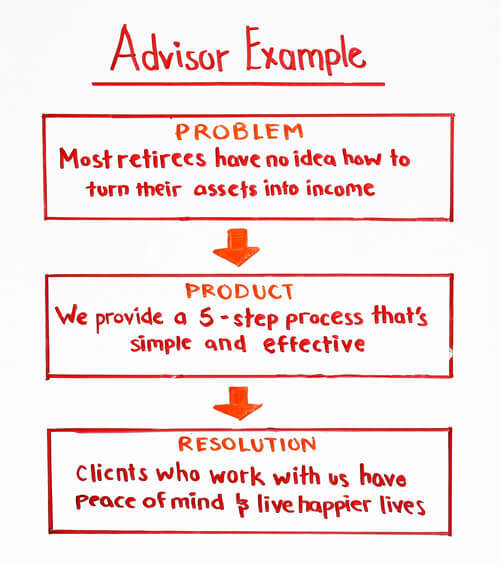 You know, most retirees have no idea how to turn their assets into income. 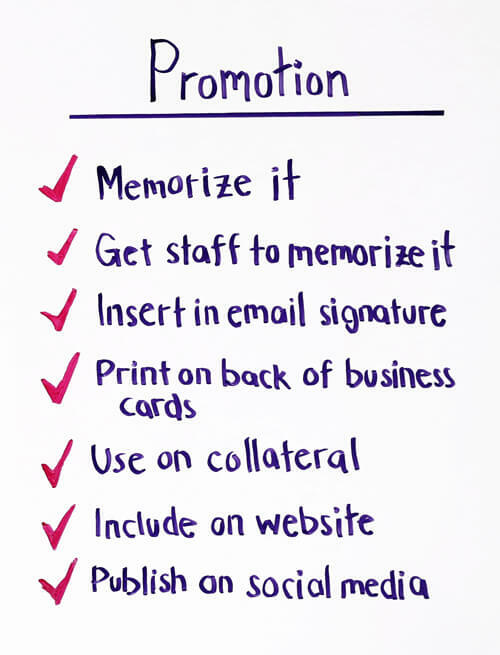 We provide a five-step process that's simple and effective. It's as simple as that. You don't have to wait next time for somebody to ask you this question. You could actually use this one-liner on a myriad of different things. First off, remember it, right? Repeat it over and over again. And what you want to do, if you're going to craft your own-liner, use natural words. And nobody wants to do some heavy lifting in their head when they're trying to consume this information of what you do. Get your staff to memorize it. They could essentially become your sales force. They're going out, they're networking, they're going to parties, they're on planes that this is your sales force right here. Not only can you be delivering this one-liner, your sales staff, too. Insert it in an e-mail signature. Below your contact information, you could literally write out this one-liner. Print it on the back of your business card. You can have this information. So they know exactly who you work with and the problem that you're solving for them. Things like brochures, fliers, worksheets, folders. All those types of things, start putting this one-liner on it. Include it on your website. This is super important to have this one-liner. Then talking about the resolution. And then publish it on social media. When people go to your social media pages, maybe it's the banner up at top. It's that one-liner, so they know exactly who you are, what you offer, and the problem that you're solving for them. I hope you found this information to be valuable for you. What I want you to do today, I really challenge you to create your own one-liner. What you can do right now is after watching this episode, grab a pen, grab a paper, and just start writing all the different types of problems. I guarantee, it happened to me. It's going to be in long-form. Start “X-ing” out some of those words. Try to get it shorter and shorter so that it's easy to say over and over again. Write down your product, work on your process, and then offer the resolution of what happens when clients work with you. And bounce some ideas off with your FSR, and they could help craft this one-liner for you. Again, thank you very much and I hope you start using this one-liner today. Dan Tatulli is the Marketing Director at LifePro. 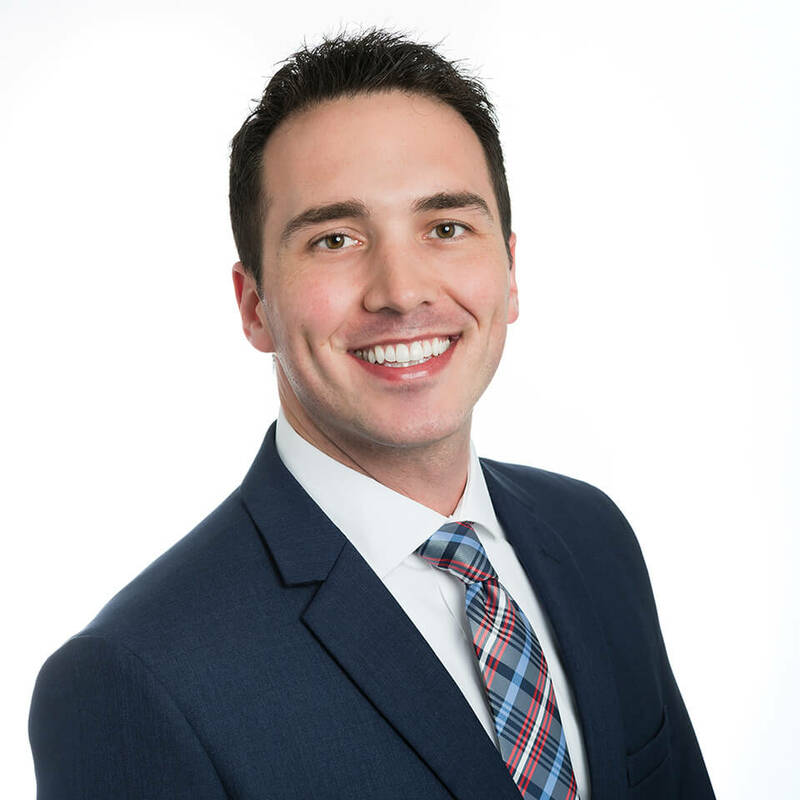 He works with financial professionals on strategic marketing and branding campaigns to deliver relevant and timely content to their community. This information is meant for educational purposes only. Episode #93: Does Your Portfolio Have Too Much Interest Rate Risk?